Everything you need to start playing and singing..
A Simple and complete solution for vocalists, small studios and gigging musicians. The package includes the PVi2 dynamic handheld microphone that's well suited for vocals on stage or in the recording studio. 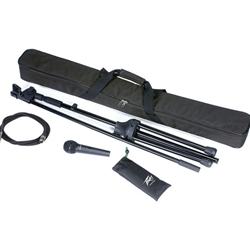 Package includes an adjustable tripod microphone boom stand, portable gig bag, 20' (6m) XLR to 1/4" microphone cable, microphone stand adapter and protective pouch.